craftmetric: Facebook Privacy & the Ticker "Hoax"
Facebook Privacy & the Ticker "Hoax"
This is just a quick post about a "hoax" that is going around on Facebook (related to your personal profiles, not business pages). I'm not sure if hoax is quite the right word – but certainly it encourages people to do something under false pretences and is likely to give people a false sense of security and misunderstanding of Facebook's privacy structure. If you follow the instructions in the post, all that will happen is that you won't see that friend's updates on your ticker any more. It doesn't change anyone's privacy settings or change what anyone on Facebook can see. It is really quite pointless, unless you are just bored of seeing that friend's updates in your Ticker! By default, anyone who can see a post can like or comment on it, so if your privacy is set to "public", ANYONE can comment on or see your status updates. So if you're sharing some controversial views, anyone on facebook can weigh in with their opinion of you and your views…. The Ticker only displays information that you're already able to see elsewhere on Facebook. It just brings more stuff to your attention than the Newsfeed does. Thus, removing people from your Ticker doesn't affect them appearing on your Newsfeed. 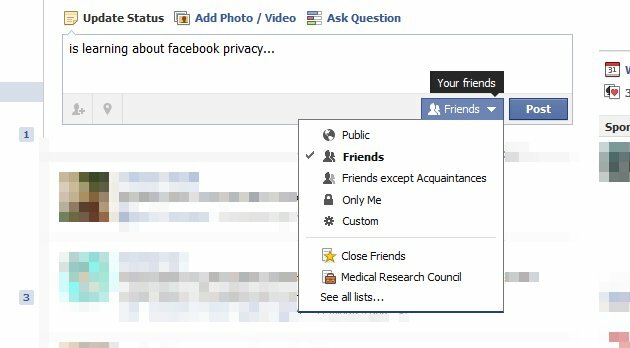 If you want your own status updates to not be seen by anyone other than your friends, then you need to set all relevant privacy settings to "Friends". When you are writing a status update, you can set the privacy of that particular update if you want it to be different to your default setting. If you comment on the status of someone else whose settings are Public, then their settings override yours, and so their status and your comment is visible to everyone, and your comment will be broadcast to your friends on their Ticker and/or Newsfeed. Likewise, if you write on someone's wall, it is their privacy settings that control who can see that post, because it's on their wall. I'll give an example. Let's suppose Amy has a friend, Bob. Bob has a friend, Carl, who isn’t friends with Amy. Amy has her privacy set to Friends: If Amy posts a status update and Bob comments on it, Carl can’t see either the status update or Bob’s comment, because he's not friends with Amy, so it won’t show in his newsfeed or ticker. Amy has her privacy set to Public: If Amy posts a status update and Bob comments on it, "Bob commented on Amy's post" will show up in Carl’s ticker. Even if Bob does not comment on Amy's update, Carl could still see Amy's status update, if he searches for and finds her profile (or clicks through to her profile from Bob's friend list), because she has set her privacy such that everyone on Facebook can see her updates, if they care to look. Also, even if Bob has his privacy set to Friends, everyone on Facebook will still be able to see his comment on Amy's status, because it's public. You can tell who a status update is shared with by looking at the small grey icon to the bottom left of the post on your newsfeed. If you see the globe – that means it's a public post and if you comment or like it, this fact will appear in all your friends' tickers. If you see the head-and-shoulders – it's restricted to friends of the original poster, so you can comment and it will not show on your friends' tickers unless they are also friends with the original poster. If you see the cog – that means the settings are custom and you can hover or click on the cog to find out who can see it. The take-home message is - if privacy worries you, then you need to consider not only your privacy settings, but the privacy settings of the people you interact with on Facebook. I really would recommend that if you have your own business and use Facebook, you set your default privacy setting for your personal account to "Friends", and also make sure that your other privacy settings are suitably set – in particular, settings for photos are separate and are set individually for each album you create. According to the Distance Selling Regulations your real name and address should be given on any sites you sell through, so it may be possible for people to work out who you are on Facebook. We share a lot on Facebook – how excited you are about your upcoming holiday, or that you're pleased to have the house to yourself this weekend – and you don't want that information falling into the wrong hands. Do note that Facebook doesn't publically link your business Page to your personal profile, so that's one less thing to worry about! If you want to read more about this, then try this blog post from computer security company Sophos or this page which is also quite informative. PS: In my Amy/Bob/Carl example above, there's one thing I'm still wondering about. In the example, if Amy has set her privacy to Friends, and Bob comments on her update, tagging Carl in the comment (and Carl approves the tag), what does that mean? Surely now Carl can see Amy's status update? Can all of Carl's friends see Amy's status update too? I haven't been able to work this out yet as you need to coordinate 4 people to test this… Amy, Bob, Carl and one of Carl's friends, Dave… I do know that if you set a photo or album to be seen by your friends only, if you tag someone in the photo then all their friends can now see your photo, and potentially everyone can see it if the tagged person's privacy is set to "Public". Thanks for sharing, that all makes complete sense. Google - more than just a search engine!